Earth Braces for Solar Storm Tonite | Watts Up With That? 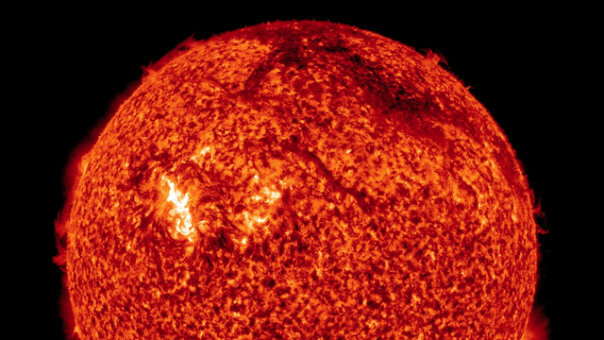 NASA announced that a massive solar flare that erupted Sunday should strike Earth some time tonite in the early AM hours (Correction, has struck Earth, details follow). The solar eruption, called a coronal mass ejection, was spotted by NASA’s Solar Dynamics Observatory, which captures high-definition views of the sun at a variety of wavelengths. SDO was launched in February and peers deep into the layers of the sun, investigating the mysteries of its inner workings. When a coronal mass ejection strikes Earth, solar plasma streams down the lines of force in Earth’s electromagnetic field, striking the upper atmosphere, where oxygen and nitrogen molecules become excited like the gas in neon signs, becoming aurorae, and triggering geomagnetic storms. Depending on the strength of the CME, aurorae can grow in size and brightness from the polar regions down to more temperate latitudes. NASA and satellite manufacturers, however, are far more worried about damage to orbiting satellites. The interwebs is coming alive with the first major solar storm of SC24. After remaining dormant since 2006, the Sun is finally coming alive. The Kp index has hit a 6 on its 0 to 9 scale. Based on this early data, this is classed as a moderate solar storm, not a major one as NASA and NOAA had earlier announced. There is minimal risk of damage to satellites. UPDATE 2: WUWT commenter R. Gates notes that the Moscow Neutron Monitor is showing a huge drop in cosmic rays coincident with this CME, which is what you’d expect. August 3, 2010 in Uncategorized. ← New carbon dioxide emissions model: "carbon dioxide emissions must be reduced to around zero by the end of the century"
But would we have been better off if we never knew what hit us? It is, according to my understanding, a C3 flare. That is basically a smallish C class. I would expect it to produce pretty lights around the poles and that is about it. No “solar tsunami”. And Drudge is headlining with the Fox story. If the Sun has no significant effects upon the Earth (climate), why does NASA et al spend billions on studying the damned thing to peer ever deeper into how it works? I accept idle curiosity as one example only! Leon, the problem is not Fox News. The problem is the people who watch it, who think what happens to celebrities IS news. I had reviewed my solar sites this morning and knew that it would not be a major storm. So I went on to other things. I did note however that CNN was all in a twitter. Spin, spin, spin. Wow. The video explains the event completely. What a blast, and on such a huge scale! This should be an opportunity for the Arctic’s area geomagnetic stations to observe not only direct impact on the Earth’s field, but the decay time. There are some indications that the Arctic’s field and solar activity are correlated. Don’t let Mann see them – he will fold the above graphs into his data as they are Hockey Stick shaped!! No one in the UK is running panic stricken into the streets over the CME. In fact people are more upset that the all too familiar heavy cloud cover will prevent the possibility of anyone seeing the aurora (sometimes visible from the far north of Scotland). Exactly so; Nasa has been exggerating the solar activity for some 2 years now. They seem desperate to have soemthing major happen just in case they are wrong about the suns influence on climate. Stayed up for the promised auroras. Cinci, OH, got some pretty stiff lightning instead. Apropos the solar/cosmic ray connection Professor Nir Shaviv of the Racah Institute of Physics in the Hebrew University of Jerusalem has a new post on his blog: – in three parts it’s well worth reading. Apparently fox news is the only news site obsessed with celebrities. There was a beautiful aurora in Denmark and in the USA this night. My thoughts too. As we’ve observed a fairly obvious cooling in recent years, contradicting ALL predictions, the MSM, esp in Australia, try to find events to prove AGW (Heatwaves, bushfires, floods etc etc) or events that “hint” at more, potential, warming events. The Sun has no effect on climate on Earth, it’s CO2 stupid! Doug it’s worse than that – this proves that due to our increased reliance on “electric trickery” – we have created a magical-netic tipping point. Unless we halt all use of this poisonous substance right now solar storms will burn us all to toast! Why not ask Piers Corbyn at Weather Action to write a piece about what its effects might be on the weather in the weeks ahead, if anything? There are some indications that the Arctic’s field and solar activity are correlated. No, this is just coincidence, and doesn’t hold up if one goes further back in time. There are more sunspots coming around the eastern limb. All this activity may awaken some of the volcanoes. It might even wake Robert Bateman up on a cold morning! I wonder how much outright hysteria will be generated when a really big M class flare throws material our way? It will be something else for the mindless and ignorant repeaters in the hysteria media to get hysterical about no doubt. The mainstream news media is changing into an outright hysteria business. The journalists, commentators, interviewers and studio anchors appear to show NO rational understanding of much of what they report on. I understand that reporters cannot be an expert on everything, but a simple understanding of the very basics is often sorely lacking and replaced by a gullible hysteria. A classic example that made me slackjawed in incredulity was the media’s reportage on the alleged mobile WMD labs discovered in Iraq which were in fact battlefield helium generators for weather balloons to assess targeting options for regular munitions. How anyone could believe for a second, that the most deadly form of biological weapons known to man could be manufactured in the curtain sided trucks shown on the news is completely beyond comprehension. Just how does one brace a spheroid in free space?? I’ve never quite come to grips with that. Well I got up this morning and the Earth hasn’t melted. That was a relief. On the other hand, I was thinking All My Troubles, Lord, will Soon be Over. So now they’re not. “Earth Braces for Solar Storm.” I think the anthropomorphic term for Earth is Gaia. How, exactly should Gaia and I brace for this? I looked at spaceweather.com and concluded that aurora wouldn’t be visible from New Hampshire (other checks revealed clouds and rain around). So I just avoided NASA web sites and went to bed without checking for falling protons. Includes Northern Lights images from Michigan. Their new mission is outreach to Muslims. The satellites are sooo 1900’s. There is probably little cause for alarm unless you hear an emergency announcement that your power is being shut-down to protect your power grid from being damaged by an anticipated exceptionally powerful geomagnetic storm. I have noted that since early 2009 that our current smoothed sunspot activity seems to be tracking the similarly smoothed activity of about 152.729 years ago. That is from my calculation of the time difference between the starts of sun spot cycle 23 and sunspot cycle 9. This does not mean there will be a ‘Carrington Event II’ around 2012.336, but, even if there were, it would probably go off in some other direction and avoid the Earth. It was billed as a huge event, yet now seems to be average, or perhaps below average? Reminds me of hurricane seasons since Katrina. Both hurricanes and the Sun have been so boring of late, the slightest activity gets coverage like the end of the world as we know it. Didn’t know the sun had it in for us: “This eruption is directed right at us”. More accurately “the earth’s orbit is in its path”. In the mid 70’s (midsummer 1975, I think), we had a phenomenal aurora display in central Wisconsin. Three fourths of the visible night sky was in full display, from the northern most horizon to nearly the southern horizon. The aurora were not the mere shimmering silver wisps we had often seen in winter on the northern horizon. This was a massive display, radiating in waves of green, gold, and silver from a central point slightly north of our local position. I and my parents watched for several hours, as the display rose, fell, and rose again in majestic magnitude. Then in their late 50’s, my parents had seen nothing like it before and I, now in my 50’s, have never seen the likes since. That was an auroral display worthy of headlines! I was up until 2 AM in Southwestern Wisconsin waiting for the lights. Saw nothing. Guess I was just at the southern edge of visibility. 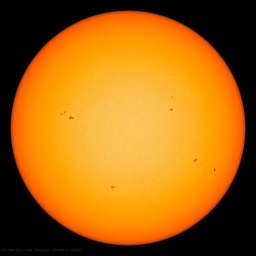 NASA solar physicist David Hathaway and his band of prognisticators have blown the sunspot-count predictions big time for solar cycle 24 and now admit the sun is in a funk not seen “in our lifetime.” They are looking for anything to hype. To their credit, they’ve refrained from linking coronal mass ejections to global warming. I wonder how many people are disappointed when a projected major storm ‘wimps-out’ and how many are just relieved. Of course, if you have just finished spending a lot of time and money getting ready for the predicted event, another emotion is possible. What does “tonite” mean? Is it an Italian name? I didn’t know they were giving alphabetic names to solar storms. Eh, didn’t get to see any pretty lights, but I wasn’t expecting any way down here in SC. On the other hand, I was hitting out to W. Africa on HF with good clear signals. I’ve always wanted to see the aurora. UK is cloudy with plenty of showers so I’ve missed it again. Can some solar scientist or climate ‘scientist’ tell me when the next big flare will be. Sorry, I’m asking to much. We haven’t got a real theory about the workings of the sun (and therefore climate) so I will just have to stick with the blog and take my chance. Keep ’em coming Anthony. How many amperes per sq.meter? or just a “summer breeze”? Based on this early data, this is classed as a moderate solar storm, not a major one as NASA and NOAA had earlier announced. There is minimal risk of damage to satellites. Those bad calculations why? They are supposed to apply the Arabic’s mathematics…. Is is a bird?, Is it a meteor?…No, it’s a flying carpet! Aurora is an spanish word which means Sunrise light, I am afraid you won’t see any auroras from the UK never more….to see them you must go to Brussels. From spaceweather.com some articles, and the solar wind has picked up from 439.1 km/sec on August 2, to 541.9 km/sec on August 4, as of a few minutes ago. Our sky turned to a very mottled and greyish appearance yesterday afternoon, about 3pm PDT. Seemed to time about the start of the Moscow NM count drop. Lasted about 1/2 hour. No winds, no fires. So it’s not worse than they thought. So deploying a giant steel mesh space antenna to catch the “green renewable energy” is a non-starter? Crud, there goes another research grant application trying to score some federal stimulus money. Dang it, with just a measly $2 million in the bank gathering interest I could “research” for life. Congress spends more than that at Starbucks! Leif Svalgaard says: August 4, 2010 at 3:57 am No, this is just coincidence, and doesn’t hold up if one goes further back in time. For a scientist of some reputation you tend to resort to nonsense far too often. Now you profess you know what happened before 1600, but you DID NOT KNOW WHAT WAS GOING ON IN 20th CENTURY. “That is not correct. Fact is it is not known. – Correlation in vuckevic’s work refers to a specific location (Denmark Strait). – The Earth’s magnetic dipole strength during the period quoted is ‘nothing like’ the field for the above. – There is no data base available which provides field intensity approximation for a particular location prior to 1590, to substitute it with the dipole’s approximation does not stand, since they appear to be totally different. In short, Dr. Svalgaard to say the correlation breaks down is misrepresenting the facts as they are known.” (quote). Once you expressed some concern for my credibility. I think you are putting on line your credibility by making denouncing statments without having data to support it. I do not know was there correlation before 1600 or not, since I have no data, if you do have data for Denmark Strait pre 1600, not dipole (since 2 are grossly out of line), lets have it so we can see, what was going on. I also have no data for solar activity before 1600, so I do not know was there correlation or not. Do you have data for the solar activity pre 1600, if you do let’s have it (it has been noted you doubt data for the 1800’s let alone 1600). Redeemer I am claiming correlation, magnetic field (z component) and solar activity since 1600, according to the data available. Do you have accurate data for both before 1600 ? If you do, then you and I, and anyone else interested can check if there is a correlation or not. I do not claim either way. You claim there is not before 1600 (with no data shown !?) but your statement ‘doesn’t hold up if one goes further back in time’ appears not to deny there is after 1600! Let’s have data, this is ‘the science blog’ no second hand car market dealership. R. Gates, you’ve got to be kidding. We will “see” a tenth of a degree added? With this noisy planet???? Intrinsic weather noise sources and our tenuous temperature measurement error buries this kind of nonsense. As it does CO2 related changes. to substitute it with the dipole’s approximation does not stand, since they appear to be totally different. How can you say they are totally different if you have no data? Anyway, the dipolar part is the greatest part [~90%] of the total [or vertical field], so if the dipole increases by a factor of two, the vertical field roughly also does. The ccd chip is operated cold to get low noise operation, however over time crud accumulates on the chip and it needs cleaning. This is done by heating the chip and evaporating the crud, aka ‘bakeout’. What you need to learn [and as I have demonstrated time and time again] is that when I say something, I can always back it up, with data, links, references, and knowledge. There is a valuable lesson for you in this. Would that be measurement time or proxy time? No offence meant, but proxy time has taken a severe dent. What is ‘proxy time’ ? There have been a number of momentary power outtages and brownouts yesterday and today lasting 1-2 seconds, and other lengthy power outtages in other communities in Southern Illinois. The power company reported they were having a problem locating a power relay that was cycling. Unable to locate the problem relay, they finally dealt with the problem by redistributing the load. So far, so good. With air temperatures reaching 102F, it is not necessarily surprising to find the power distribution systems becoming prone to some failures. However, it is tempting to wonder whether or not the CME event has contributed in some measure, large or small, to exacerbating the problems and faults in the power distribution system that resulted in the outtages? Ya, they say if you’re just relaxed you don’t get injured. Leif Svalgaard says: August 4, 2010 at 5:49 pm ……………. As a scientist claiming expert knowledge in this field you make number of assertions, which are either uncertain or even contradicted by facts. MY case for correlation for the last 400 years is based on numerical DATA from the world most respected institution. For YOUR claim YOU have no data ! But sure enough it was there and it was absolutely spectacular. It lasted all night long. Huge multi-colored glowing curtains in the sky. The next day the paper reported it was one of the most spectacular aurora displays ever recorded in Michigan and was easily viewed all the way down into central Indiana. I wonder just how big a CME caused that one. I saw the aurora again a few years later on a summer night in northern Michigan but it was in the distance in the northern sky and not as bright and vivid. The earlier one appeared to be right over us and all around us. It’s one of my fondest memories. Nasa is in the business of space exploration. It is fortunate that we don’t have anybody halfway to Mars right now as intrepid space explorers caught out by such an event end up lightly toasted to deep crispy fried. One important reason Nasa studies such events is in the hope of eventually coming up with an early warning system to help mitigate the cooked astronaut problem. You also failed to produce data for solar activity before 1600, but of course, it does not exist; C14 and B10 are grossly contaminated (even you claimed that B10 proxy is only a good proxy for B10). How do you calculate correlation without data for both variables with no numbers available. for period for which there is no numerical data. Don’t you think that is a spurious claim? Let’s remember I did not say what may or may not be case pre 1600. The last 400 years should be sufficiently long period (especially since there is no data before then) to consider that there is some value to it. It seems they have achieved that. On their page there is this link to the observational numerical] data: “Data used to construct CALS7K.2”. The solar data can be extracted form 10Be with enough confidence to get the envelope of the variation, so data exists. and click on sun in the left hand column. Sorry Pamela, but you’re just flat out wrong on this one. We expect about one tenth of a degree change and that may be in the data, but not ‘a few tenths’. Came here to see Vuk and Leif bicker.. Came here to see Vuk and Leif bicker.. Leaving satisfied..
On your video map the area Vuk is considering has the same intensity as Central African republic. Noaa’s map shows field of 50-51000 (Vuk’s graph gives ~50.8micro Tesla =59000nT) for the Denmark Str. and 0.0 (ZERO) nano Tesla for CAR. Your video map cannot therefore be a reliable reference for assessment of Vuk’s correlation! Any explanation for such INCREDIBLE differences? Vuk is referring to vertical Z component. The movie shows the radial component Br. This is just another name for the vertical Z component. The movie shows the real magnetic field of the Earth where it is generated [in the core]. At the surface we see a blurred version of that [and much weaker]. But it is possible to calculate the field at any point from the CALS7K.2 coefficient. Also in the Denmark Strait. One finds that the dipole now gains the upper hand and basically determines the Br [or Z]. Near the equator, Br becomes zero at the surface, but not at depth. In the polar regions the higher harmonics maintain their shape [c.f. the two lobed structure seen in modern maps]. Only the values are strongly diminished with respect to the dipole. As I said, there is data, it is of reasonable quality and the vertical component during the MWP was much stronger in the Denmark strait than today. Live with it. • Things are getting a little noisy in Colombia. I mentioned a few weeks ago about a possible explosion at Nevado del Ruiz. Now we have reports of increased seismicity under nearby Cerro Machín and ash plumes from Nevado del Huila. After a few centuries of relative quiet, it looks like the volcanoes of the Colombian Andes are looking more lively. • Also in South America, a gas plume was spotted at Chile’s Planchon-Peteroa. This is the second time this year that increased gas emissions have been noted at the volcano that hasn’t erupted since 1998. • Shiveluch on the Kamchatka Peninsula in Russia continues to rumble – ash plumes were produced from pyroclastic flows and steam-and-gas plumes reaching 4 km / ~13,100 feet were spotted as well. This could be really bad, this thing is BIG, really BIG. Its not predicted to erupt real soon, but they think it might within the next 50 years. I’ve looked for further info on this large volcano and found almost nothing. Deepening solar minimums and volcano’s make me a little nervous, sorry. Gail is correct, there are five Russian ones on yellow and orange alert. The little smiley shows the Denmark Strait. The red cicles shows the GUFM 1590-1995 model results. As you can see, the ‘correlation’ breaks down for earlier times. This should put this issue to bed for good. 2) the intensity [or Z which is virtual identical to the intensity in the Arctic because of the field being nearly vertical] does not correlate neither with solar activity nor with temperatures. You are graph is wrong! It is at odds with Z values calculated by Zurich database. It shows steep decline 1500-2000, which is not correct. Further more resolution of your map is far too low to make any sensible conclusion either way. Colour maps may be pretty (in this case even that is doubtful), numbers are required to prove or disprove the case. Initially you need to produce numbers for the last 400 years, to see that there is a good agreement between databases, which it is not, so prior to 1600 could be only a at best speculative and unreliable estimate. Your task is to bring down correlation for which we have data, not to base your case on speculative estimates for era of no data available! Last 400 years is good enough to establish good base to start from for considering the present and near future, but it should be noted I did not make any claims for period before 1600. You also contradict yourself about 10B proxy accuracy, and now numbers there either. No bona fide numbers, NO contest. Correlation as shown in my work is still unquestionable! I do not whish to spend any more time on your futile attempts to use questionable distant past to bring down the unquestionable most recent one. See you another time another place. Your CALS7K data base is no good. Here is plot at 5 year resolution for the known period 1600-1950. The model is so BAD even for the years where there is a solid and reliable record. So I take it the big storm was abig bust; I didn’t notice anything much hitting my house and I waited all day. Your CALS7K data base is no good. Here is plot at 5 year resolution for the known period 1600-1950. The model is so BAD even for the years where there is a solid and reliable record. The CALS7K is an update of GUFM1 and supersedes it, so any disagreement is due to defects in the earlier model. But you would not be the first to prefer an old, obsolete data set because it ‘fits better’. To repeat: there are NO measurements in the Arctic before 1882. All is based on paleomagnetic intensities [which are not bad]. The CALS7K incorporates much more data that the obsolete GUFM1, so is the best data we have, produced by the foremost experts in the field [Monika Korte (Potsdam) and Cathy Constable]. I know both and they don’t come any better. You cannot be serious! I know you are joking, since CALSK database is a joke. London has one of the most accurate magnetic records of 20th century. Strange that CALSK data base stops at 1950 ?! Perhaps your friends think we due for a magnetic reversal ? Of course, I’m serious. 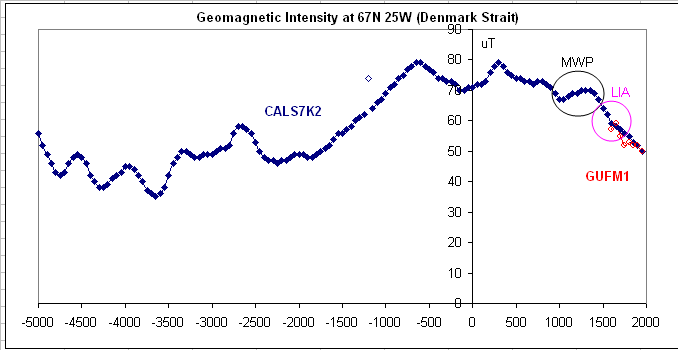 The CALS7K2 data base is state-of-the-art, the best we have of the geomagnetic field in the past, e.g. before 1882 when there were NO intensity measurements in the Arctic whatsoever. CALS7K2 is not meant as a description of the small-scale features of the field today. Next time one of these storms applies for my attention I’m going to demand a pretty good resume before they get the position. I’m sick of these endless disappointments. In other words, I’d say the Age of Chicken Little is becoming a crashing bore. 6 level 2 (orange) and 14 level 1 (yellow) alerts in Indonesia. REDOUBT, SARYCHEV PEAK in 2008-2009. You just never know, this was a deeper, longer minimum. Looking at cycle 20, which is what I think we’ll get out of cycle 24, though a more elongated 20, the volcanism wasn’t real bad. A cluster of VEI-4’s around the minimums before and after cycle 20. The eruptions after 20 made it cold and snowy as we remember. But it could have been a lot worse if there had been a VEI-5 and/or 6 thrown in. It is very interesting that the VEI-5’s and 6’s of the 1900’s seem more clustered around the ramp down of larger cycles like 18-19 and 21-22. Working just like a big ‘ol thermostat for Planet Earth. I’m going to quit worrying about it so much.